In my recent post on Ennerdale Water I referred to the interaction between geology and man in shaping the characteristics of a lake (see “A lake of two halves …”). As I was writing, I had in mind some famous early work on this topic by Harold (“W.H.”) Pearsall, a botanist who made some of the first tentative steps towards linking patterns and processes in lake ecosystems, whilst working at the universities of Leeds and Sheffield. He had visited many of the lakes since boyhood and co-opted his father as a field assistant to cycle around the Lake District performing the surveys that formed the basis of this paper. Pearsall had noted differences in the types of plants growing in the various lakes in the region, and attributed these differences to the geology of the surrounding land. 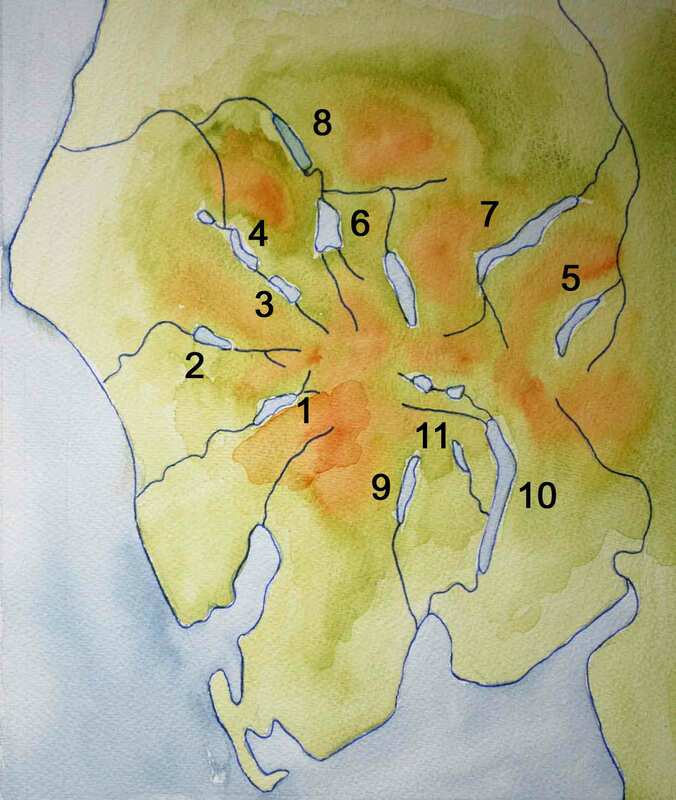 He took this idea one step further by also suggesting that the lakes became modified as they increased in age, illustrating this by arranging the English Lakes into an “evolutionary sequence”, with Wastwater and Ennerdale Water representing the least evolved, and Windermere and Esthwaite Water representing the most advanced. His first proposition is now well-established amongst those who study lakes; the second is also generally accepted (I remember writing an essay entitled “Lakes are temporary features of the landscape” as part of my A-level Geography course), although his use of the English Lakes to illustrate this is not. The lakes of the English Lake District, arranged in the evolutionary sequence proposed by Pearsall: 1: Wastwater; 2: Ennerdale Water; 3: Buttermere; 4: Crummock Water; 5: Hawes Water; 6: Derwent Water; 7: Ullswater; 8: Bassenthwaite Lake; 9: Coniston Water; 10: Windermere; 11: Esthwaite Water. 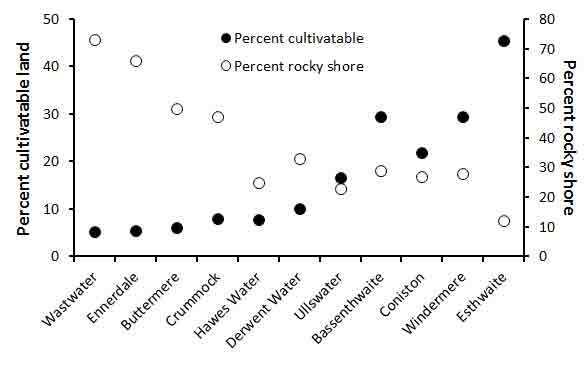 The graph below makes Pearsall’s case, using his own data (note that his records for Hawes Water refer to the small natural lake that was submerged to form the current Haweswater Reservoir). The left hand axis shows the proportion of land in the catchment of each lake which was under cultivation (at the time of his study) steadily increasing as we move through his evolutionary sequence. The right hand axis shows how proportion of the shoreline of each lake that was rocky (down to a depth of 30 feet – 9.2 metres) steadily decreases through the sequence. He pointed out that both the amount of cultivatable land and the character of the shoreline depended largely on the character of the surrounding country. A graphical representation of Table 1 in Pearsall (1921): “Effects of erosion”. Lakes are arranged in order of Pearsall’s “evolutionary sequence”. 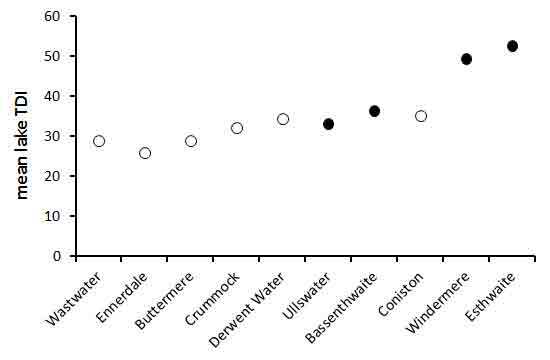 Average lake TDI values (using data from Bennion et al., 2014) for Lake District water bodies, arranged by Pearsall’s evolutionary sequence (no data for Hawes Water). Open circles are low alkalinity lakes; closed circles are moderate alkalinity lakes. Clapham, A.R. (1971). William Harold Pearsall. 1891-1964. Biographical Memoirs of Fellows of the Royal Society 17: 511-540. Pearsall, W.H. (1921). The development of vegetation in the English Lakes, considered in relation to the general evolution of glacial lakes and rock basins. Proceedings of the Royal Society of London Series B 92: 259-285. This entry was posted in Ennerdale and the River Ehen and tagged diatoms, ecology, Lake district, Pearsall. Bookmark the permalink.